FRESNO, CA – Mayor Ashley Swearengin, joined by City Manager Bruce Rudd, Congressman Jim Costa, and City Transportation Director Brian Marshall, officially launched the construction of the $54 million, 15.7 mile Bus Rapid Transit System for the City of Fresno. The ceremony took place at the FAX Terminal at Manchester Center. The system will feature a total of 27 stops, and will serve major shopping centers, hospitals, and other significant destinations in the City of Fresno. The transit line will connect all major north-south corridors, Blackstone Avenue, and a major east-west corridor, Ventura Avenue and Kings Canyon Road through downtown Fresno. The project includes 51 stations: 24 station pairs (or 48 one-way stations), two terminal stations, and one transit center with a shared platform station. The system will be run with 17 new low-floor, multi-door, compressed natural gas low-emission 40-foot vehicles. The difference between the Bus Rapid Transit system and the traditional fixed route service is simple; wait times and customer boarding takes less time, schedules are more reliable due to transit signal priority ten-minute service frequencies during peak transit times, travel times are faster due to fewer stops, stops are located ½ mile apart compared to ¼ mile stops. 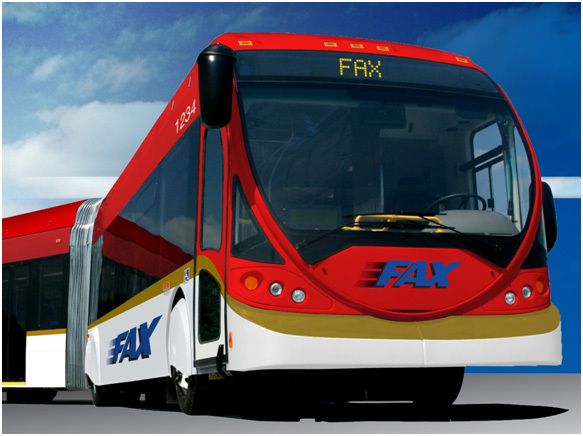 “While our Bus Rapid Transit system will offer a fast and reliable service along the busiest transit corridors in Fresno, BRT is not just about transit service," said City Manager Bruce Rudd. "We’ve also changed the land use regulations along the BRT routes so property owners have a lot more flexibility on how they can develop their property. By combining land use and transportation plans, we’ve got the right tools in place to spur infill development and revitalization." Construction is set to begin mid-June 2016 with a projected date for start of service for Fall 2017.